Near here stood Gloucester Hall (built ca. 1660s), where Bacon’s Rebellion effectively ended with the fatal illness of its leader, Nathaniel Bacon, in 1676. In 1684, this house served as the first Virginia residence of Royal Governor Francis Howard, baron Howard of Effingham, whose wife, Lady Philadelphia Pelham Howard, died there in 1685. Col. John Pate, a member of the Council of State, built the house on his 2,100-acre plantation, including 1,141 acres that his uncle Richard Pate had patented in 1650. Col. Thomas Pate inherited the plantation in 1672. Both Richard Pate and Col. Thomas Pate represented Gloucester County in the House of Burgesses. Location. 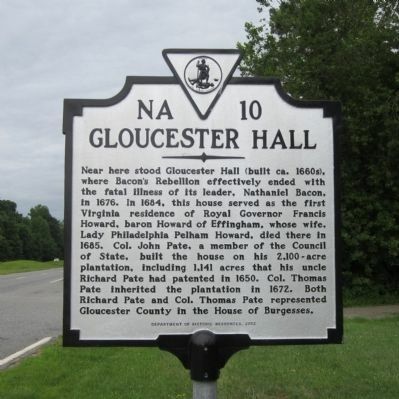 37° 29.001′ N, 76° 37.415′ W. Marker is near Gloucester Courthouse, Virginia, in Gloucester County. 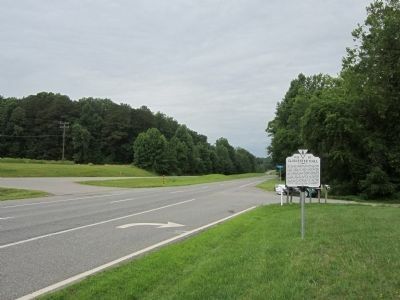 Marker is at the intersection of George Washington Memorial Highway (U.S. 17) and Bacons Lane, on the right when traveling west on George Washington Memorial Highway. Touch for map. Marker is in this post office area: Gloucester VA 23061, United States of America. Touch for directions. 8 other markers are within 7 miles of this marker, measured as the crow flies. Poplar Spring Church (approx. 1.7 miles away); The Indentured Servants' Plot (approx. 2 miles away); King and Queen County / Gloucester County (approx. 2 miles away); Poropotank Creek (approx. 2 miles away); Marlfield (approx. 2.6 miles away); Bethel Baptist Church (approx. 5.1 miles away); a different marker also named King and Queen County / Gloucester County (approx. 5.6 miles away); Indian Princess Pocahontas (approx. 6.6 miles away). More. Search the internet for Gloucester Hall. Credits. This page was last revised on June 16, 2016. This page originally submitted on June 22, 2014, by Bernard Fisher of Mechanicsville, Virginia. This page has been viewed 508 times since then and 34 times this year. Photos: 1, 2. submitted on June 22, 2014, by Bernard Fisher of Mechanicsville, Virginia.